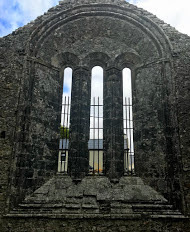 Travelling into the Burren Country in Co Clare on Saturday afternoon [21 July 2018], six of us began our tour by visiting Saint Fachan’s Cathedral in Kilfenora, Co Clare. The name Kilfenora may mean the Church of the White Brow or Meadow, or Fionnuir’s Church. 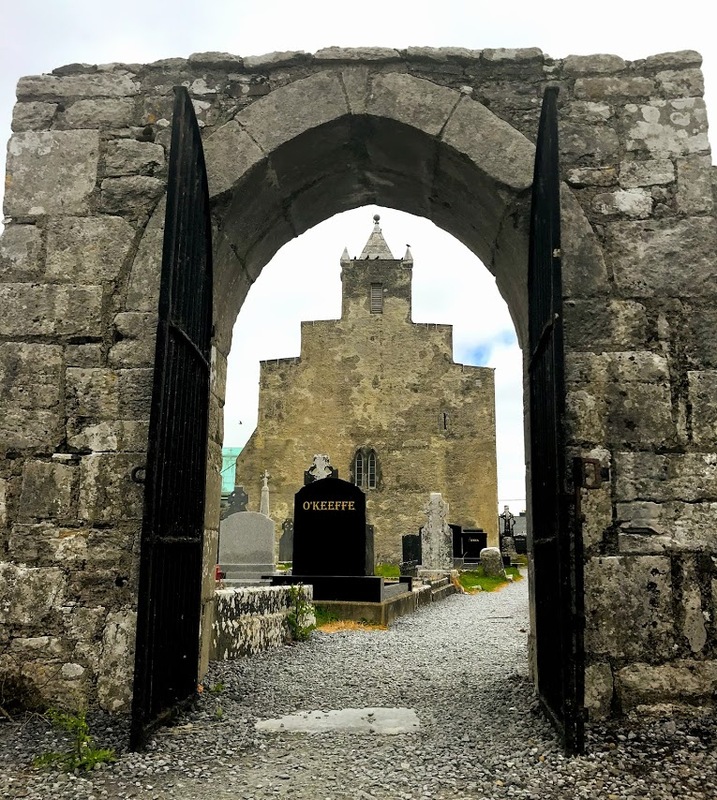 In either case, the story of Kilfenora dates back to at least the sixth century when, according to tradition, Saint Fachan, also known as Saint Fachanan, Saint Fachtna or Saint Fachtnan, first built a church here. This saint has also been identified with Saint Fachtna, the founder of Roscarbery in Co Cork. The first church building here was probably of wood and was followed by a stone building. But the early church was burned down in 1055 by Murtough O’Brien. It was rebuilt in 1056-1058, only to be plundered in 1079 and then destroyed in an accidental fire in 1100. 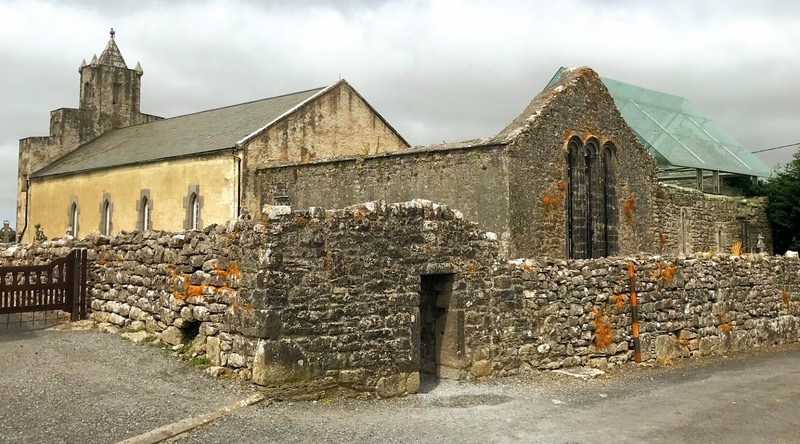 Kilfenora could not have been of great significance in the years that followed, and if there was a Diocese of Kilfenora it was ignored at the Synod of Rathbreasail in 1111. 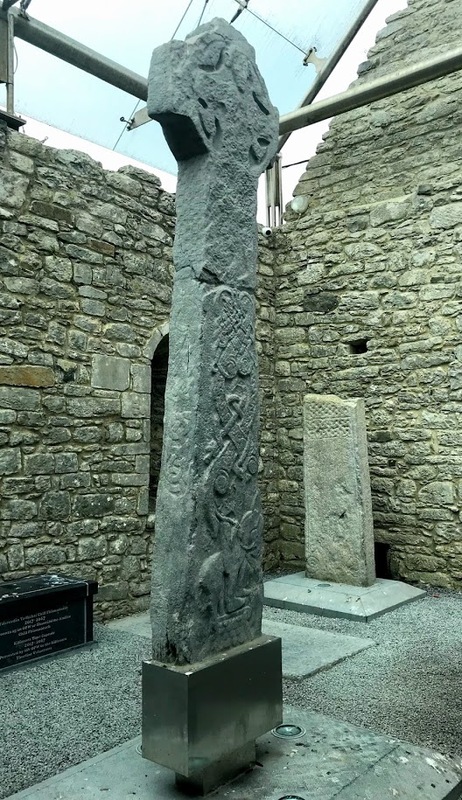 However, Kilfenora was recognised as a diocese at the Synod of Kells in 1152, when a new diocese was one of three carved out of the Diocese of Killaloe. The smaller dioceses of Roscrea and Scattery Island lost their new diocesan status within a short time, but Kilfenora remained the centre of a diocese that corresponded with the ancient territory of Corcomroe. By the 12th century, there were six or even seven high crosses on this site at Kilfenora, forming one of the largest collections of high crosses in Ireland. Nevertheless, over the centuries, there were few willing or able candidates who were willing to become Bishop of Kilfenora. An unnamed Bishop of Kilfenora took the oath of fealty to Henry II in 1172, but his two successors are known only by their initials. The first names Bishop of Kilfenora, Bishop Johannes, was appointed in 1224, but even then many of his successors are only known by their first name alone. In time, Kilfenora was the second smallest diocese in Ireland, with Waterford the only diocese that was smaller. The Diocese of Kilfenora is 29 km long, 14.4 km wide, and extends to 55,000 ha (135,700 acres). It is slightly smaller than the adjacent Diocese of Kilmacduagh, and both are about half the size of the Diocese of Ross in west Cork. The three Aran islands – Inisheer, Inishmaan and Inishmore – were also included in Kilfenora. The list of Bishops of Kilfenora is still not clear in the immediate post-Reformation period, and it is still not clear whether the loyalties of Bishop John O’Neylan (1541-1572) were to Rome or to the Anglican Reformation. The crown made no appointment to the diocese between 1541 and 1606, and from 1606 to 1617 Kilfenora was held with Limerick. Because Kilfenora was a remote, impoverished and insignificant diocese, it continued to be difficult to attract bishops in the 17th century. When Richard Betts arrived in the diocese in 1628, he declared ‘I have no wish to become bishop of the poorest see in Ireland’ – and he promptly returned to England. Ten years later, Bishop John Bramhall of Derry, later Archbishop of Armagh, told the Lord Deputy in 1638 that Kilfenora was so poor that no-one wanted to go there. Robert Sibthorpe would only accept a nomination if he was allowed to remain Dean of Killaloe. He was the last separate Bishop of Kilfenora, and after his death in 1661. 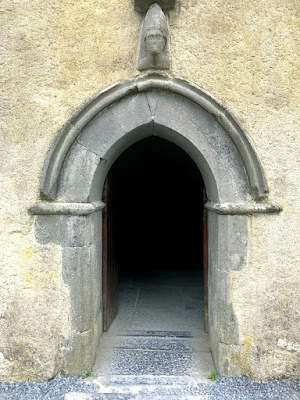 Kilfenora continued to be regarded as an impoverished diocese throughout the 17th, 18th and 19th centuries, and its survival depended on being united with various dioceses, including Limerick, Tuam, Clonfert, Killaloe (1752-1976) and Limerick and Killaloe (since 1976). Richard Mant, Bishop of Killaloe and Kilfenora (1820-1823), visited Kilfenora shortly after becoming bishop in 1820, and described it as ‘the worst village that I have seen in Ireland, and in the most desolate and least interesting country’ – a reference to the Burren and not to Ireland. Saint Fachan’s Cathedral dates from 1189-1200, when it was built in the so-called Transitional style with a nave and a chancel, and the early building may have been aisled. According to local tradition, the chancel, dating from late 12th to early 13th century, had an oak ceiling decorated in blue with gold stars, and this survived until the end of the 18th century. There is some evidence of alterations and extensions in the 14th and 15th centuries, but little remains of this work. Today the church shows a curious mix of styles from a number of periods. The oldest part is probably the rough-cast north wall of the nave with blocks that are now covered with plaster. The former chancel is now without a roof. It is 10.8 metres long and 6.3 metres wide, and the walls are about one metre thick. 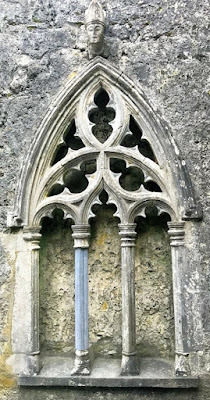 The three-light east window is rounded and moulded, with carved capitals. On both sides of the window is a carved effigy: a bishop with his right hand raised in blessing, possibly dating from the early 14th century, to the north, and a tonsured, bareheaded cleric holding a book, possibly 13th century, to the south. An elaborately carved and screened recess in the north wall is often described as a 15th-century Gothic sedilia, but the seats between the piers are too narrow and, instead, it may have been a 15th century wall tomb. On the south wall, there is a double sedilia with a plain dividing shaft, a double piscina, and a square aumbry. One of the tombs in the chancel is the burial site of the Very Revd Neptune Blood, who received his name because he was born at sea. The memorial in Latin names his seven children, dating from 1683 to 1700. Dean Blood was an uncle of Thomas Blood, who tried to steal the crown jewels of King Charles II in 1671. A short 15th-century doorway in the north wall of the chancel leads into a rectangular building attached to the north-east of the Chancel. 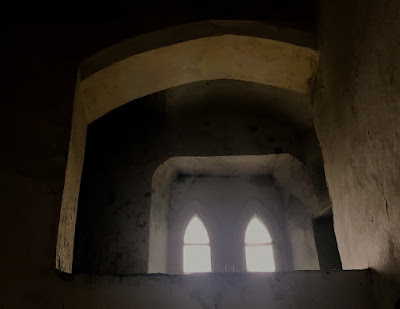 In the 19th century, this was known as the Lady Chapel, although it may have been a sacristy or chapter room, or the O’Brien Chapel mentioned by earlier historians of the cathedral. It may have been built at the same time as the main building, and at first may have served as a transept. Here there are two lancet-type windows, a broken two-light window, arched recesses and a low double piscina. The chancel and the nave were separated in 1837 and by 1839, ‘thirty-six feet of the east end’ was without a roof. The nave, which is 20.6 metres long and 6.3 metres wide, was rebuilt and refitted as the Church of Ireland parish church with a grant of £42 from the Ecclesiastical Commissioners. The west wall of the nave has crude, stepped gable that has been compared to ‘a pile of emigrants’ luggage, with a rabbit hutch or birdcage overhead.’ There is a small bell-turret at the apex that is topped by a small stone pyramid. There is a carved head of a bishop over the door into the south porch. 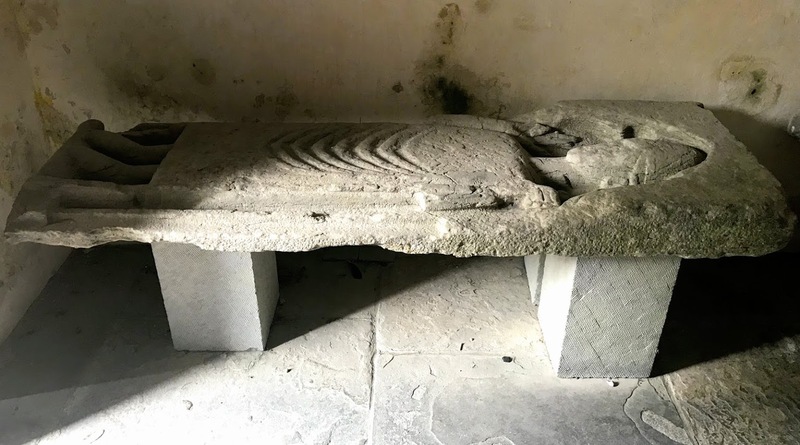 Two grave slabs that have been moved into the south porch have effigies representing a 14th century unnamed Bishop of Kilfenora, with a mitre, crosier and episcopal ring, and a priest or nobleman of the 14th century, holding a book. Inside the parish church, the large square stone baptismal font possibly dates from around 1200. The bishop’s throne was donated in 1981 from the enthronement of Walton Empey, Bishop of Limerick and Killaloe, as Bishop of Kilfenora. Today, the cathedral remains in a partially ruined state. The National Monument Service carried out restoration work in the early 2000s. The ‘Lady Chapel’ or north transept was fitted with a glass roof in 2005 to protect the remains of the three high crosses that were moved there. The finest of these high crosses is the Doorty Cross with a carving of bishop, possibly representing Saint Fachan. The shaft of this high cross was reused in the 18th century as part of the gravestone of the Doorty family. In 1955, it was reunited with the upper part of the cross, which until then had lain in the chancel of the church. The ‘North Cross’ has survived relatively intact. Unlike the other crosses on the site, it does not have a ringed head, but has distinctive carved ornamentation. 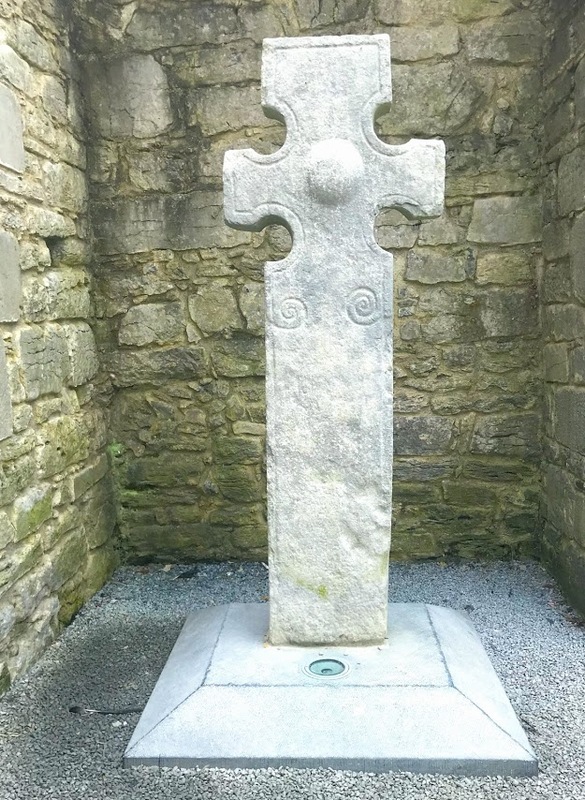 One of the high crosses was moved from to Saint Flannan’s Cathedral, Killaloe, in the 19th century. Today, Saint Fachan’s Cathedral is only remaining Church of Ireland parish church in the Diocese of Kilfenora. 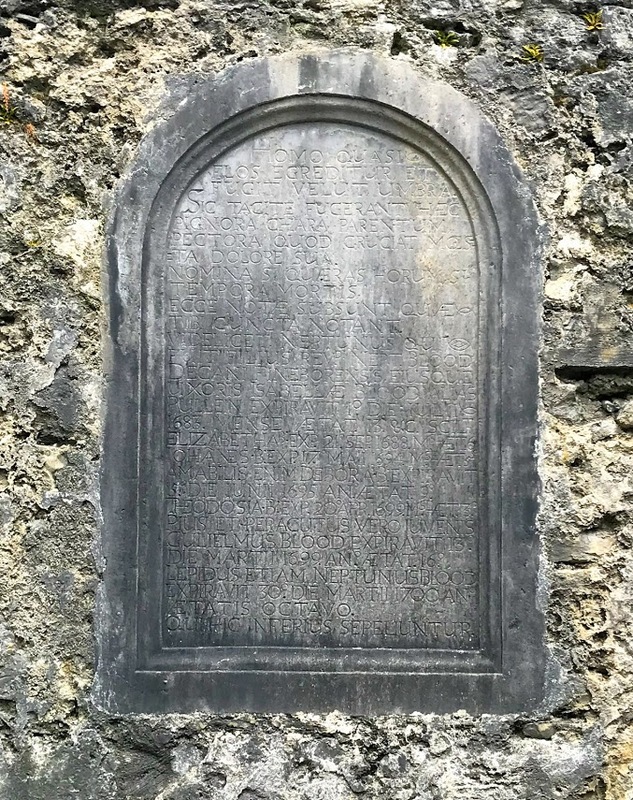 It is grouped with Drumcliffe (Ennis) group of parishes, where the Rector is Canon Robert Hanna, and the Dean of Kilfenora is the Dean of Killaloe, the Very Revd Gary Paulsen, who is also the Dean of Clonfert and the Provost of Kilmacduagh. The last Roman Catholic Bishop of Kilfenora, James Augustine O’Daly, died in 1749. A year later, in 1750, the diocese was united with Kilmacduagh. In 1883, Kilfenora and Kilmacduagh was merged with the Diocese of Galway. Today, the bishops of Galway and Kilmacduagh are styled Bishop of Galway and Kilmacduagh and Apostolic Administrator of Kilfenora, because Galway and Kilmacduagh are in the Province of Tuam and Kilfenora is in the Province of Cashel. This means that, in Canon Law, the Pope remains the Bishop of Kilfenora. I remember visiting Kilfenora with my father (Henry Wheeler, who wrote many pamphlets for the OPW) and also with Helen Rowe of the RSAI. I always felt sorry for the poverty stricken congregation. I remember visiting Kilfenora with my father (Henry Wheeler who wrote pamphlets for the OPW) and also with Helen Rowe of the RSAI. I always felt sorry for the poverty stricken congregation.